I just got a new Gigabyte H61M-S2P motherboard and found that when the computer starts there is no POST screen that tells me how to enter BIOS and all. I ignored it because I didn't need the BIOS. But it all happened today, I left my computer on and went to do something and when I came back I found a message saying there is no storage device and when I pressed OK it went to the BIOS menu by itself. I know what the whole no-storage-device thing was, I just adjusted the hard disk cables and it worked, but let's go back 5 minutes before that. I found an option to change the amount of Internal Graphics Memory, it was set on 64MB (I'm using the onboard graphics card) I didn't know that the dedicated video memory could be changed so I changed it to 1024 MB (Yes, I know it's stupid now but didn't know then). The problem is: I have only 2GB of RAM and now it's 1GB due to the increase in the graphics card video ram and I can't reenter the BIOS to readjust it. And for heaven's sake get more RAM. Windows 7 is going to run horribly on 2 gigs of Memory. Unless things have changed dramatically tapping the DEL key repeatedly as soon as you power up should get you to the setup screen. Has worked with every gigabyte board I've used previously. The old chestnut about reading the manual might also shed some light on the matter. When you get into cmos/bios setup there may be an option to display the posting screen instead of the motherboard logo (if that's what you're getting) and/or a setting to extend the time the bios key options are displayed so in the future you won't wonder which keys do what. Tapping the Delete key should get you into your BIOS set up (If yes, jump down to 'reset defaults' below). 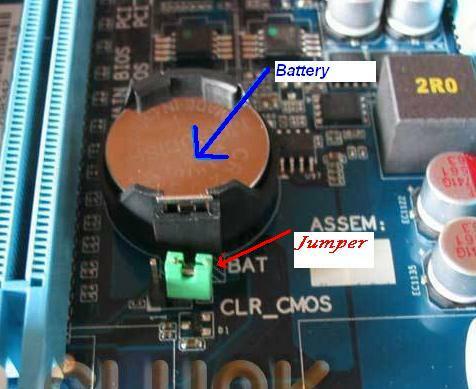 If not, you will need to reset your CMOS (see manual) using Jumper (power must be disconnected and jumper returned to idle location before power is restored). Then reset BIOS defaults, then go back in to manually set CPU, Memory, time, date, hard drive as bootable, and boot order (at least). Then you should be back where you were before you began experimenting. › Gateway laptop stuck on Gateway screen. Can't access BIOS. You just got a brand new board & didn't bother to read thru the manual? "To access the BIOS Setup program, press the <Delete> key during the POST when the power is turned on." I've tried every key possible; Del- from F1 to F12 and nothing works after I press them the computer just gives me a blank screen without a blinking cursor. The curious thing is when I hit the pause button I get the POST screen with the GIGABYTE logo, however the screen somehow seems stretched or zoomed in so I can't see the whole thing. For example I see only 'GABYTE' written not the full word. I don't know if that's something wrong with my monitor. "I've tried every key possible"
The only possible key is DEL. If it's not working, your keyboard is the problem. If you're using a wireless or USB keyboard, try a PS/2. Power up the system & immediately start tapping the DEL key. I've just checked the manual and it's definitely the Delete key that accesses the BIOS setup, restarted the computer and tried it again and still got the blank screen. As for clearing CMOS it seems like a risky process I'm going to ask someone who is more expert than me to do it. My keyboard is PS/2 and it's working given that when I press DEL it actually does something. I've been trying to remove my HDD cables while windows is running to make the same problem that caused it to open the BIOS at the first time.. but all it does is restart it does not give that message it had given me before about "no storage device"
"I've been trying to remove my HDD cables while windows is running"
Are you deliberately trying to fry something? NEVER plug or unplug anything while the system is running (except for USB devices). "As for clearing CMOS it seems like a risky process"
Not at all. Just unplug the power cord, remove the side panel from the case, move the clear CMOS jumper cap from it's normal position to the clear position, wait a few seconds, then move it back again. Replace the side panel, plug in the power cord, then boot up. You'll probably be prompted immediately to enter the BIOS to correct the settings. There should be a setting in the BIOS screens to Enable fast boot. You want to disable that. Also disable any logos. Then you should see the POST screens. Thanks again for all of you. I updated my BIOS using @bios utility and things are back to default now, so problem solved.